This Manhattan hotel is in the Midtown West neighborhood, 0.8 mile from Times Square and within one-half mile of the New Amsterdam Theater and Madame Tussauds Wax Museum. 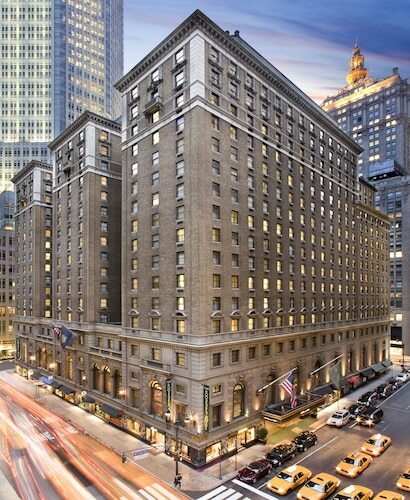 Located at the corner of East 45th Street and Madison Avenue, the Roosevelt Hotel, New York City, provides ready access to shopping, as well as Broadway theaters, 3 blocks away. 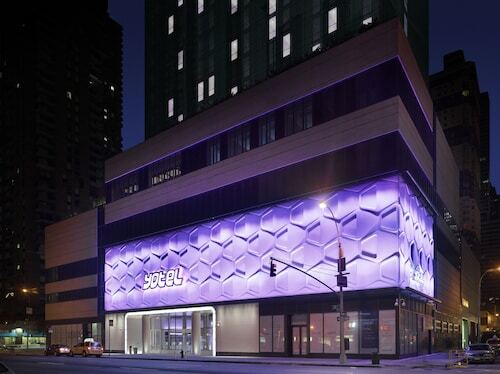 This New York hotel is in the center of all the action, located in the cluster of Broadway theaters. The center of Times Square is 2 blocks away, and Rockefeller Center is a 3-block walk. 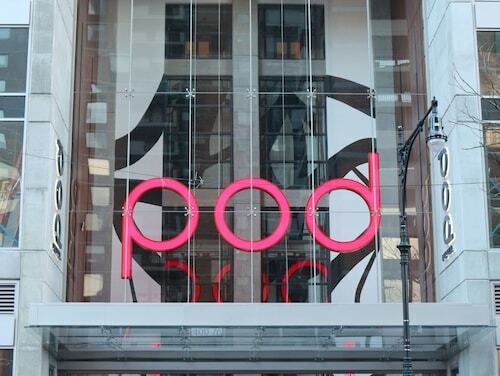 Rising 40 stories across from Madison Square Garden and Penn Station, this hotel is 1 block from Macy's, 3 blocks from the Javits Convention Center, and 4 blocks from the Empire State Building. Set amid Broadway theaters, this stylish New York hotel is a half-block from Times Square and half a block from Restaurant Row. Bryant Park, Minskoff Theater, Gershwin Theater, and Radio City Music Hall are also nearby. Head to nearby Central Park, 5th Avenue, Rockfeller Center, and the Museum of Modern Art. Located in Midtown, this hotel is within a 10-minute walk of New York Times Building, Madison Square Garden, and Times Square. Madame Tussauds Wax Museum and New Amsterdam Theater are also within 10 minutes. 42 St. - Port Authority Bus Terminal Station and Port Authority Bus Terminal are within a 5-minute walk. 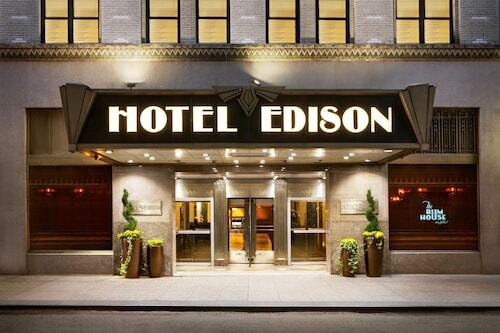 Located in Midtown, this hotel is steps from Richard Rodgers Theatre, Music Box Theatre, and Eugene O'Neill Theatre. Broadway and Minskoff Theater are also within 5 minutes. 49th St. Station is only a 2-minute walk and 47 - 50 Sts - Rockefeller Center Station is 7 minutes. This 52-story Midtown New York hotel is a half-block from Times Square and Broadway; Fifth Avenue is less than 2 blocks east, Rockefeller Center is 5 blocks away, and Central Park is a mile north. This Midtown New York hotel, renovated October, 2013, offers a desirable location diagonally across from Carnegie Hall, 1 block from Broadway, 2 blocks from Fifth Avenue shopping, and 2 blocks from Central Park. The Theater District and Times Square are within 1 mile. 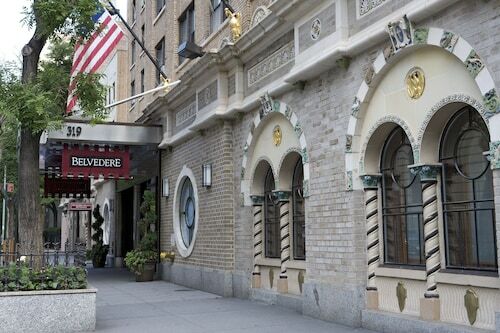 This New York hotel is located 1 block east of the major concentration of Broadway theaters, 2 blocks from Rockefeller Center, and 3 blocks from the Museum of Modern Art. 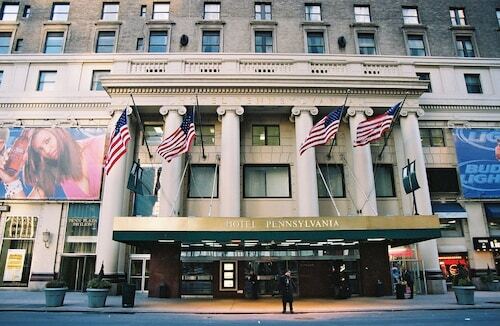 This New York City hotel located on Seventh Avenue at 33rd Street is across from Madison Square Garden and Penn Station. Nature's works of art are wonderful to witness. Bryant Park is one such example. New York, the city where it's situated, is a popular place to visit any time of the year. After an exhausting day out, you can relax and decompress at one of the many hotels within walking distance. Within 0.6 miles (1.0 kilometer) of Bryant Park, there are up to 171 candidates. The Langham, New York, Fifth Avenue, The Chatwal, a Luxury Collection Hotel, New York City and The Library Hotel by Library Hotel Collection are a few of the choices. You'll be astounded at how far your savings go at the area's value-for-money hotels. Try out the Chelsea Savoy Hotel, only 0.9 miles (1.4 kilometers) away, or, you can try the Comfort Inn Times Square West, which is 0.5 miles (0.8 kilometers) away. After an action-packed day of adventure, lay your head down at one of the upmarket hotels a short commute away. You may want to stay at the St. Regis New York, only 0.8 miles (1.3 kilometers) away, or the Mandarin Oriental, New York, 1 mile (2 kilometers) away. Spoil yourself by sampling one too many cakes, cookies or pastries at Le Pain Quotidien (70 West 40th Street, New York, conveniently located 0.1 miles (0.2 kilometers) away. Cap off a day’s adventure by heading to Southwest Porch - Bryant Park (41 West 40th Street, New York), and enjoying a couple of drinks with your travel buddies. Should you be eager to visit a quiet place where you'll have the opportunity to find some interestng reading materials, visit New York Public Library, a local library featuring excellent collections. If you're a fan of theater, you'll love the entertainment waiting for you at Town Hall. If you can't fit in any of the more famous museums, expand your knowledge at International Center of Photography. Go to Algonquin Hotel to snap a picture of this iconic building. Pay a visit to Belasco Theatre and have a great time watching its gifted actors give it all they've got. Give yourself a break and jump on the train to Bryant Park. From Grand Central Terminal, the nearest station, it is a simple walk of 0.4 miles (0.6 kilometers). A different stop you might like to try is 33rd Street. It's pretty close too, at 0.4 miles (0.6 kilometers) away. Need insider tips on must-see attractions in Bryant Park? Check out our Bryant Park travel guide! How Much is a Hotel Room in Bryant Park? 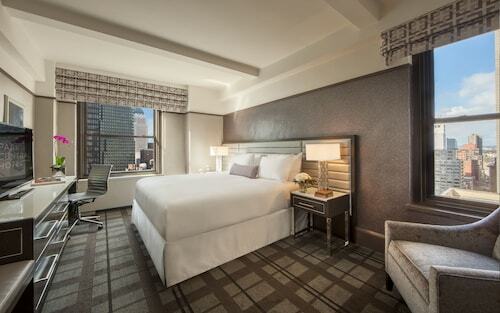 Hotels in Bryant Park start at $85 per night. Prices and availability subject to change. Additional terms may apply.